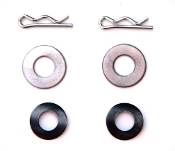 Retainer clips, spring washers, and washers. For connecting the clutch lever rod from the bellcrank to the clutch pedal. For 1970-74 AMC V-8 manual transmission models.